Sneak peek - Eeni Meeni Miini Moh & e3-M for summer! Sneak peek – Eeni Meeni Miini Moh & e3-M for summer! It’s true that colour makes my world go round so the first thing I thought upon seeing the newest gear from Babyology faves Eeni Meeni Miini Moh and e3-M was “Oh the glorious colours!”. Could there be a colour combo dearer to my heart than yellow with dove grey? 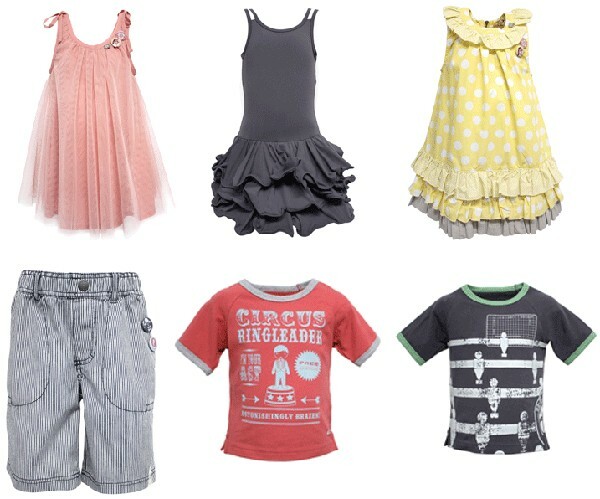 Little girls will look smashing in polka dots, ruffles and pleats with boys in smart graphic t-shirts and tailored striped shorts. Eeni has listed its signature colours for the upcoming season as butter, crimson, clover, airborne, bay blue and elephant – oh to be a fly on the wall when they’re brainstorming those fabulous colour names! You’ll find the Eeni Meeni Miini Moh range drawing inspiration from circus themes with the e3-M collection opting for a Game Heroes look. We love the sneak peek we were given so we thought we’d share with you – of course much more will be revealed! The Eeni Meeni Miini Moh and e3-M collections are due to be launched in August so sit tight until the next update.